NEW! Amazon Aurora with MySQL compatibility now supports publishing of all logs to CloudWatch Logs using the process described below. Amazon RDS has long offered customers the ability to view and download logs associated with their DB instances for troubleshooting purposes. 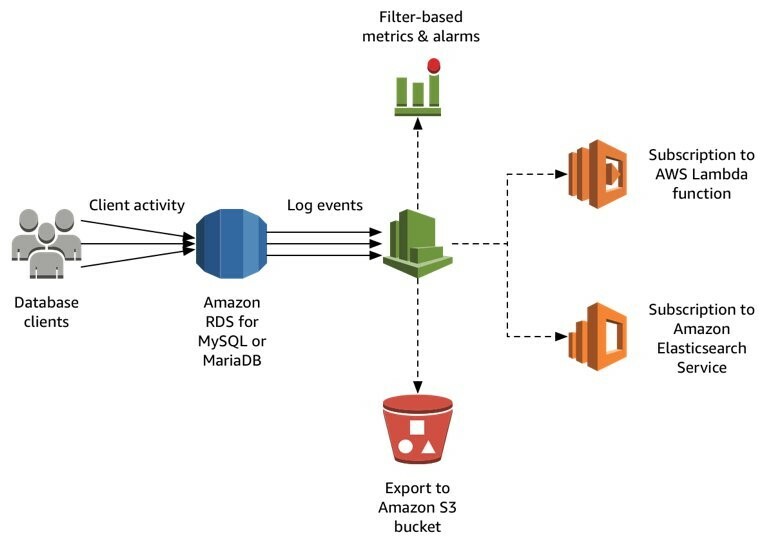 Now, with Amazon Relational Database Service (Amazon RDS) for MySQL and Amazon RDS for MariaDB you can publish your DB instance log events directly to Amazon CloudWatch Logs. By publishing your logs, you can build richer and more seamless interactions with your DB instance logs using AWS services. Error log – contains diagnostic messages generated by the database engine, along with startup and shutdown times. General query log – contains a record of all SQL statements received from clients, and also client connect and disconnect times. Slow query log – contains a record of SQL statements that took longer to execute than a set amount of time and that examined more than a defined number of rows. Both thresholds are configurable. Audit log – provided by using the MariaDB Audit Plugin, this log records database activity on the server for audit purposes. Refer to the Aurora MySQL documentation for more information on advanced auditing in Aurora. Your log data is durably stored in CloudWatch Logs and encrypted at rest. However, your logs might contain sensitive information—configuration and data—for which access should be restricted to appropriate users in your account. Therefore, it is important to configure appropriate IAM access policies for the log groups containing database logs. 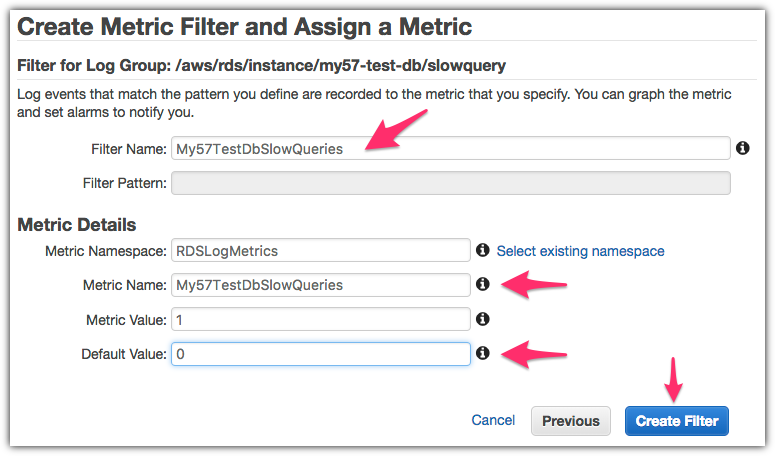 Amazon RDS publishes logs from your DB instances to log groups in the same account as the DB instances using a service-linked role, which permits Amazon RDS to access to the relevant log groups in your account. After enabling log publication, you might see an additional IAM role named AWSServiceRoleForRDS in your account. 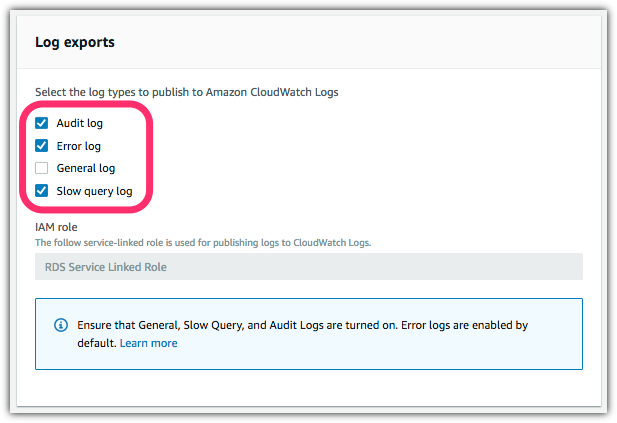 To enable log publication to CloudWatch Logs, you can take the following approach. The error log is enabled by default, and you don’t need to perform any additional actions to work with it. The audit log can be enabled by adding and configuring the MariaDB Audit Plugin for both MySQL and MariaDB instances. Our documentation explains how to create a custom option group with these settings. For Aurora MySQL, refer our documentation on using advanced auditing. Set general_log = 1 to enable the general log. As preceding, check the MySQL or MariaDB documentation for additional tuning parameters. Set log_output = FILE to write logs to the file system and publish them to CloudWatch Logs. Note: Exercise caution when enabling the audit log and general log on production DB instances. Because these logs can capture and record every statement executed, their use can cause performance degradation on your DB instances. In the steps following, we illustrate how you enable this feature on a new DB instance. You can also enable log exports on existing DB instances, by modifying an existing DB instance. Note: The steps following use the new RDS Management Console experience. If you are still using the old console interface for RDS, the log export options aren’t available. In the top right corner of the Amazon RDS console, choose the AWS Region in which you want to create the DB instance. Choose Launch a DB Instance on the console dashboard, as shown following. 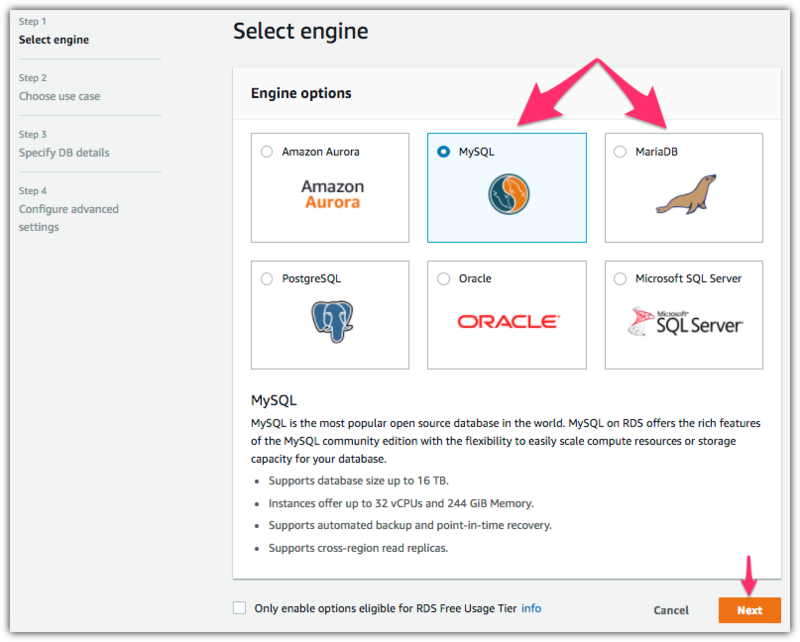 Choose either the MySQL or MariaDB engine, as shown following, and then choose Next. 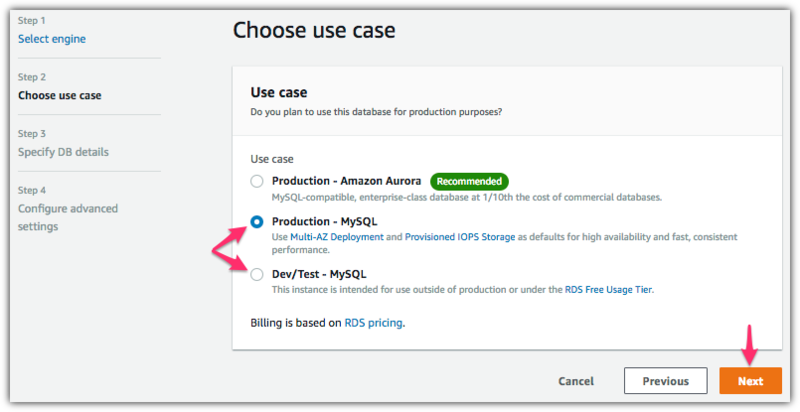 Choose either Production – MySQL/MariaDB or Dev/Test – MySQL/ MariaDB at the use case prompt, as shown following, and then choose Next. Set the instance specifications, including size, high availability, storage properties, identifier, master user name, and password, and then choose Next. You can find more details about these settings in our documentation. On the advanced settings screen, configure the networking and security, encryption, backup, monitoring, and maintenance settings as desired. More details about each option are available in our documentation. In the Database options section, depending on the logs you plan to enable (see the prerequisites preceding), choose the relevant DB parameter group and Option group, as shown following. These might be the defaults provided, or custom ones. In the Log exports section, shown following, choose the logs that you want to export and have enabled using the configurations discussed preceding. When you have enabled log publication, subject to the activity on your database server, you see the relevant log groups present in the CloudWatch Logs console. By default, Amazon RDS configures your log groups to never expire. By choosing that expiration value in the console, shown following, you can change the retention policy for your log events. Amazon CloudWatch Logs charges for the amount of log storage that you consume, so we recommend that you retain logs for only as long as the data within is valuable. By choosing the log group, you can drill down and browse the log events in the log streams. For example, browsing the error log events you might see information similar to that shown following. 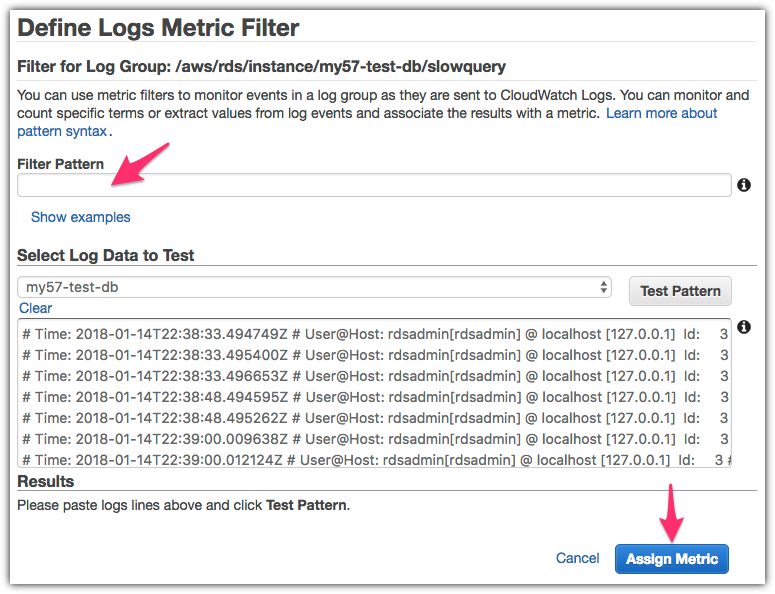 You can create filters on the specific patterns found in your log events, and publish CloudWatch metrics based on those. You can use those custom metrics in turn to create alarms, notifying you when abnormal conditions occur. For example, you can monitor the volume of slow queries occurring on your DB instance. Slow queries can be a result of workload requirements. However, unexpected changes in the volume of such queries can indicate performance problems. Slow queries are captured in the slow query log. The related events appear as in the sample following in the slow query log group. You can create a metric filter by choosing the relevant log group, with a name ending in /slowquery, and then choosing Create Metric Filter (see the illustration preceding). Leave the Filter Pattern field blank to select all log events, as shown following, then choose Assign Metric. Next, configure the CloudWatch custom metric by specifying a filter name and name space and giving the metric a recognizable name, as shown following. We also recommend setting a default value of 0 (zero), to use as a baseline for reporting intervals that don’t contain any slow queries. You might need to choose Show advanced settings to see this option. Choose Create Filter. 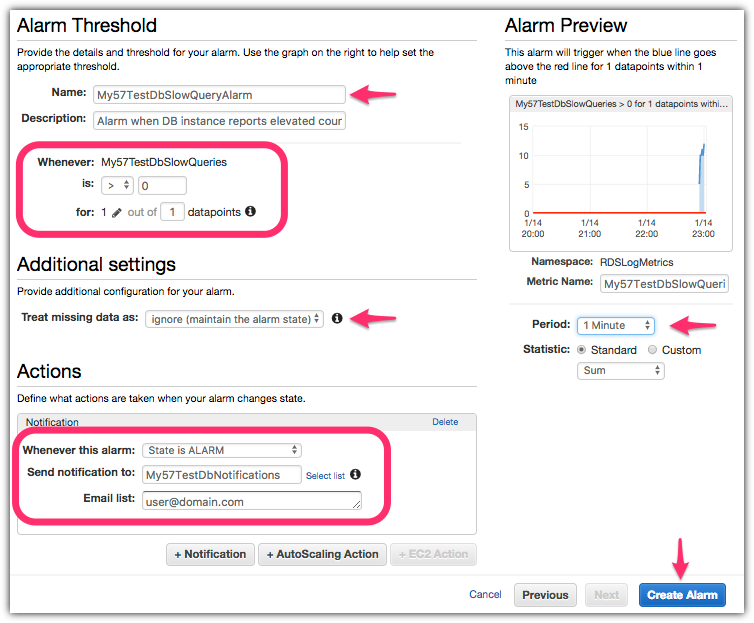 Finally, you can configure an alarm to notify you when your DB instance reports slow queries that take longer than the expected level for normal load. To do so, choose Create Alarm. To set up the alarm, configure the alarm conditions and notification targets, as shown in the screenshot following. Give your alarm a recognizable name and configure the alarm condition. If you want to be notified any time that there are any slow queries, set the condition to: is > (greater than) 0 (zero). Use a larger threshold if you normally have slow queries that are acceptable in your use case. Also set the desired monitoring period (the default is five minutes) and the notification target, for example the email address of a database administrator. Choose Create Alarm. While Aurora MySQL-compatible already had support for publishing Audit logs to CloudWatch Logs using the Advanced Auditing feature, we have now added support for the error, slow query and general logs as well. Aurora clusters now support enabling log publishing for all log types (including the audit logs) using the process described above. Monitor the volume of failed connections to the database (a common request for security compliance purposes). Use the audit log and configure a metric filter with a filter pattern of “FAILED_CONNECT“. You can also detect failed connections from the error log using the filter pattern of “[Note] Access denied for user“. Monitor for mysqld process starts and restarts. Use the error log and configure a metric filter with a filter pattern that looks for a relevant string, such as: “starting as process“. You can also export database logs to Amazon S3. When your logs are in Amazon S3, you can configure lifecycle policies to archive the logs and set a retention policy in accordance with your organizational needs. When your logs are in Amazon S3, you can also query logs using Amazon Athena for long-term trend analysis. For details, read the blog post Audit Amazon Aurora Database Logs for Connections, Query Patterns, and More, using Amazon Athena and Amazon QuickSight. Although that post discusses audit logs for Amazon Aurora, the audit process is similar for Amazon RDS MySQL and MariaDB logs. Amazon CloudWatch Logs also supports real-time processing with subscriptions for Amazon Elasticsearch Service and AWS Lambda. With the former, you can analyze database logs in the popular visualization tool Kibana. With the latter, you can trigger functions and automations when matching database log events are published to CloudWatch Logs. 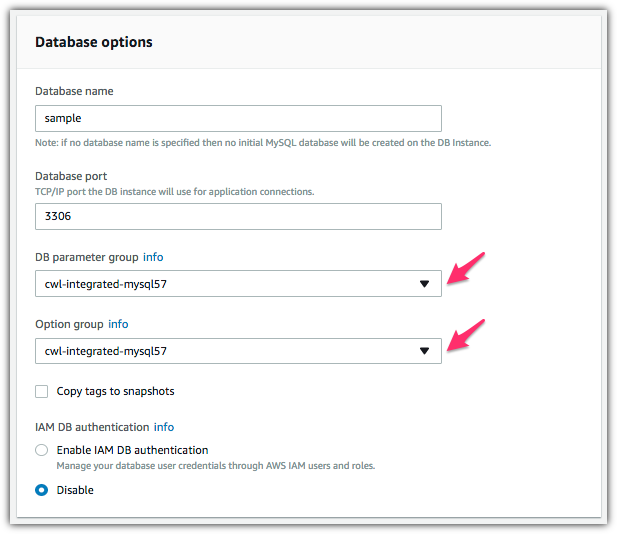 Exporting Amazon Aurora MySQL, Amazon RDS for MySQL and MariaDB logs to CloudWatch Logs provides a powerful mechanism to derive additional value from your database logs. Vlad Vlasceanu is a specialist solutions architect at Amazon Web Services. He works with our customers to provide guidance and technical assistance on database projects, helping them improving the value of their solutions when using AWS.